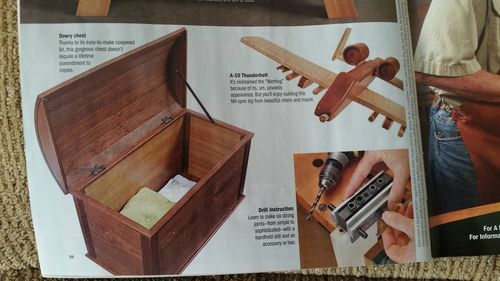 Can anyone tell me which issue number of wood magazine had an article and plans for a steamer chest. I have most of the magazines, but wood wants too much money for an index. See if Dec. ‘98 (issue 110) is the one to which you refer. I think I rem,ember the one you’re after, but don’t remember it being that long ago. Here is a sneak peek. I can send you a PDF copy. PM me your email addy. Yeah, WOOD sure made it as hard as possible to search/research the magazine archives. It used to be FREE and looked like a “contents” page(s) in a book of magazine… But not anymore. They want to sell you a DVD of back issues, regardless of how many hard-copies you have. Maybe check out the New Yankee Workshop? Seem to recall Norm made a Steamer Trunk in one episode. You might find it on youtube? Or, order the plans ( and a video?) from the site. I have a copy of that issue in PDF form that I’d gladly send you. PM me you email address.